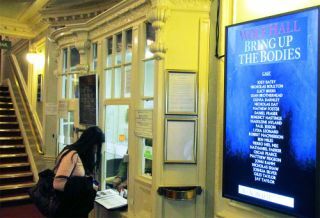 Aldwych Theatre in London’s West End has selected and implemented a two screen Tripleplay digital signage and live streaming solution for its foyer area, a solution designed to ensure late arrivals to a performances do not miss the show. Tripleplay's live streaming solution in the foyerOpened in 1905 Aldwych Theatre is a 1,200 seat West End theatre that has survived two world wars, has seen well over a century of theatrical performances, was the home for the Royal Shakespeare Company for over 20 years and was listed grade two in 1971; as such, installing any kind of technology is always a challenge. The solution has minimum cabling requirements and allows the theatre to harness its existing cabling infrastructure and IP network to stream live performances from the stage to television screens, incorporated into digital signage layouts. Tripleplay’s head of sales, Matt Cooper, commented; “Working in a grade two listed building is a challenge for all involved, the venue itself, the integrator and the technology provider. Any solution had to be sympathetic to the architecture and venue but still needed to provide a high quality experience. Top Boxes or to Smart TVs.